PSN Creative is seeking a female host for a New York City-based live, weekly digital series for a major online media outlet. Candidates should have excellent on-camera charisma, a sharp sense of humor, and the ability to roll with the punches to carry a live broadcast. Production will take place weekly in New York City, so only local candidates should apply. If interested, please send relevant clips and information to hello@psncreative.com to be considered. PSN Creative is assisting in the casting of a professional, paid photo shoot in the Buffalo/Western New York Area. The shoot is for a locally based infant wellness product. This shoot will take in the Buffalo area on either November 14, 15 or 16, 2018. Shoot will be short to make sure both baby and families are comfortable. Additional details including rate will be shared with those who apply. Act fast! Guaranteed consideration closes on Friday, October 26, but later submissions are still welcome until we find the right folks. Billy and Pat have once again partnered with HelloFresh to promote their simple and tasty meal delivery kits, and this time they cooked up some amazing apricot chicken. Take a look as the pair prepares this delightful springtime dish, and make sure to use their promo code "billypat30" for $30 off your first week of deliveries with HelloFresh. Would your business or service benefit from some influencer promotion? Shoot me an email and let's make a plan! When we were invited to a friend's wedding in Los Angeles we thought it was the perfect opportunity to tack on a few extra travel days to get some R&R in the California desert. We spent three days at a tiny, isolated, wonderful AirBNB in Twentynine Palms, CA, just on the border of Joshua Tree National Park. We did some hiking, some exploring, took a sound bath at The Integratron, but mostly just sat on some old patio chairs eating chips and salsa and loving every relaxing second of it. Check out the vlog of our vacation that shows all of the interesting stuff with minimal chip eating. To prep for the trip (and to have something to listen to at our wifi-less getaway) we made a playlist of songs perfect for a modern desert retreat. Take a listen if you'd like. See more videos from Billy & Pat on YouTube. Meet Jackie Wrafter, owner of Allentown's new creative rental space, GEORGETTE. The beautiful, raw space is available to rent for parties, classes, workshops, photo shoots, and pretty much event a person could imagine. Watch the video and get to know Jackie, how she is inspired by other local businesses like Fern Croft, and why she thinks Billy Club and Buffalo Melting Point are the best places to get "drunk and fat" in the neighborhood. If you missed it, be sure to watch our previous videos with Amanda Ferreira of Rust Belt Threads and Michele Ogden of Whimsy Confections. Want to nominate someone to appear in the series? Shoot me an email and let's talk. We're always looking to showcase interesting members of the community and their work. Now casting high school seniors or juniors around the nation for a prom series (interview and photoshoot) for Refinery29. Ideal candidates are those foregoing traditional prom dress code policies and wearing outfits that represent their gender identity and/or gender expression. Candidates can be anything from cisgender to non-binary or LGBTQIA+ and must be a high school senior or junior who is permitted to attend prom this year. Interested candidates should send an email to hello@psncreative.com with their name, age, location, high school name, and some information about their prom look. They should also include a few relevant photos if possible. I am thrilled to finally share a project I've been working on for the last few months! Today marks the launch of the first video in a new series with Buffalo-based lifestyle blog Nickel City Pretty. PSN Creative teamed up with Nickel City Pretty creator Lindsay Robson to develop a companion piece to her popular "Nickel City Gritty" interview series. The intent is to further showcase the fun and lighthearted interactions she has with local business owners and newsmakers through video. After you watch the video be sure to read the full interview between Lindsay and Pete to learn more about the man behind the brand. Highlighting local businesses, go-getters, and personalities is one of my favorite creative outlets, and I'm always looking for new ways to shine a light those who are doing something special. If you have an idea for the next Nickel City Pretty video (or something else entirely!) don't be shy, say hi! 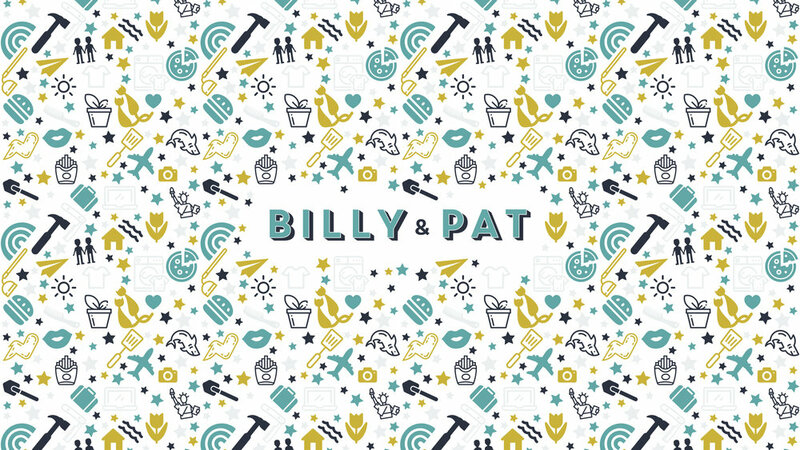 Billy & Pat have been creating content online together since 2012 when they started their YouTube channel Billy & Pat Vlog to document their engagement and wedding planning process. What started out as a way to answer common questions they received about their impending nuptials evolved into a channel focusing on relationships, lifestyle, home ownership, and travel. The original channel branding was no longer the best representation for the content being created, so PSN Creative teamed up with Seek Axiom to overhaul the brand elements. The new branding includes a clean and modern word mark, a new color scheme of mustard, teal, navy, and grays, plus a bevy of branded icons to use as background ephemera. There is also a custom animation sequence for use in videos. A brand refresh or overhaul can seem daunting, but it's always smart to take a look at the way you are representing yourself or your business, and to be OK with modifying the presentation to keep things looking relevant, attractive, and interesting. Do you feel like your business or brand could use a quick cleanup? Get in touch and let's talk about the best plan of action!